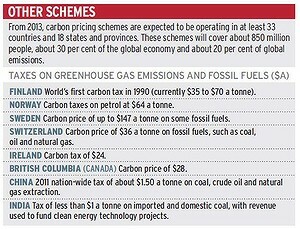 Carbon pricing schemes across the world. THE carbon price puts Australia, the world’s 15th-biggest emitter of greenhouse gases, in the middle of the international pack when it comes to dealing with global warming, a major new report by the Climate Commission says. The report, which summarises international efforts on climate change, found 90 countries and about 90 per cent of the global greenhouse gas bill were now subject to policies that were cutting emissions. The report said the world was on track to have a fighting chance of avoiding dangerous global warming, and said many countries have carbon taxes and emissions trading schemes in place, some with higher carbon prices than Australia. About 850 million people live in countries or states with a direct carbon price, including some of Australia’s economic competitors, plus the biggest emitters, China and the US. Finland’s carbon tax ranged from $35 to $70 a tonne of CO2 and taxes on fossil fuels in Norway, Sweden, Switzerland and Ireland were higher than Australia’s carbon price of $23 a tonne, the report said. US states and Chinese provinces are also about to introduce emissions trading schemes, in addition to the Europe-wide trading scheme. But the federal opposition said the findings did not contradict the assertion that Australians pay the highest carbon price in the world, citing an assessment by the Productivity Commission. ”The Productivity Commission could not have been more categorical in making it clear that no country has an economy- wide carbon tax equivalent to what has been imposed in Australia and that is not disputed in this latest report from the Climate Commission,” the opposition climate spokesman, Greg Hunt, said. The government understood the report to mean almost the exact opposite. ”The Climate Commission’s new report shows countries around the world are taking action to reduce emissions, giving the lie to the opposition’s claims that Australia is acting alone by introducing a carbon price,” the Minister for Climate Change, Greg Combet, said. The chief Climate Commissioner, Tim Flannery, said the report’s assessment of carbon pricing in different countries was accurate and showed that Australia’s role matched its population size and emissions profile.